"The Creature from The Black Lagoon" is arguably the last classic horror film released during the golden age of Universal Studios, the same distributor that released the still-beloved black-and-white incarnations of "Dracula," "Frankenstein," "The Wolfman," "The Mummy," "King Kong" and other indelible imaginings. The movie wouldn't work without the title creature, a prehistoric "missing link" between sea and land animals who is pictured in totality fairly early in the story, compared to some well-known movie monsters, and who arguably has more personality than any of the humans tangling with him in the Amazon jungle. 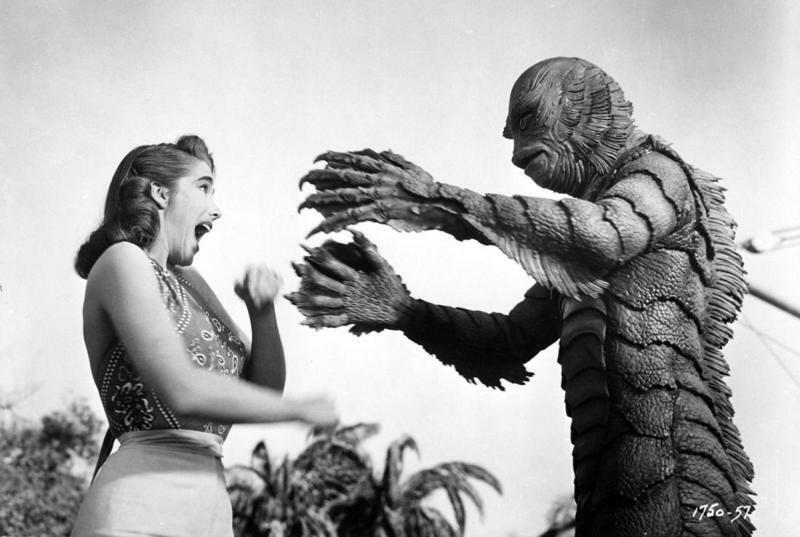 When did you first discover the classic Universal monster movies, and what was it about "The Creature from the Black Lagoon" that struck a chord with you, or that seemed different from the rest? I first started watching the classic Universal monster movies when I was a teenager. Creature really stuck out among the other Universal monsters because he’s not the villain. He elicits so much empathy from the audience. How do you go about finding historical or biographical materials for somebody who is, for reasons of historical erasure, just a couple of steps up from a "civilian"? It's easy to find information on somebody like Rick Baker or one of the Westmores, less so with somebody like Milicent Patrick. Finding historical materials for Milicent Patrick was extraordinarily difficult and I have many, many librarians and archivists to thank. I spent nearly a year talking to historians and visiting various libraries and archives all over Southern California before I had enough material to even begin a proposal for the book.I found all of it thanks to some really incredible libraries and archives! There’s one special archive in particular that really made a difference for me, but I won’t spoil which one it is. There's practically a second book happening underneath the first one, having to do with your own experiences as a woman writing about and learning about popular culture, and exploring how Milicent's experience mirrors yours. It’s easy to dismiss the story of what happened to Milicent Patrick as just “how things were” back in the 1950s. But it’s not just “how things were.” What happened to Milicent Patrick is still happening right now to women in every single industry, in 2019. I wanted to make the book feel both more accessible and more urgent. The best way I knew how to illustrate that was by weaving in stories of my own parallel experiences in the film industry. A lot of biographies leave this stuff in the background or summarize it in the introduction or end notes while leaving it out of the main story. Why did you decide to incorporate it into the main text and be so transparent about all the different steps and stages? I really wanted readers to see just how difficult it was to uncover her story. By showing the trials and tribulations of finding out what happened to her and where she went, I also show how enduring the effects of Milicent getting her credit taken away were. It didn’t just affect her life in the 1950s, it affected her legacy and left thousands and thousands of potential fans and filmmakers and artists bereft of a role model. One of the most harrowing (though brief) parts of the book is the section about Milicent's affair with the Disney animator Paul Fitzpatrick, whose wife killed herself after she found out about the relationship. How did this knowledge affect your perception of Milicent, and how does one go about discovering and confirming something like that, again with the understanding that it's easier to get that kind of information if the subject is already very well-known? It was very important to me to put all of Milicent’s story in—all the good and all the bad. If I edited out parts of her life to make her look better, I’d be implying that women are only worth writing about if they live a life without mistakes. Milicent Patrick deserves to have her story told, no matter what. Women can be flawed and still be heroes. You write about the way the story of the film took shape, with different forces pushing and pulling to transform the story, particularly in relation to how much screen time the heroine Kay gets, and how she's portrayed. How do you think this dynamic is reflected in modern science fiction and fantasy movies, both in terms of what ends up onscreen and what happens during production? And do you think the producer, William Alland, and the director, Jack Arnold, ultimately made the movie better or worse this regard? Having a system of checks and balances is almost always the best way to make art. It can go off the rails if it’s pushed too far in either direction - one person having all the control, or too many - but I think it’s essential to filmmaking. I think having a team giving feedback to Alland and Arnold made the film better. If Alland had his way, we’d have a different, less memorable Creature! Can you describe the arc that took you from imagining Milicent's life and talent, and the conclusion that you ultimately came to after doing all that research and forming a clearer picture of her? She’s still my hero, maybe now more than ever. By the end of the research and writing, I have even more respect for her as a person and as an artist. Being able to see her as a flawed human being, rather than just a mysterious figure, made me relate to her and love her more. There are a lot of secondary showbiz characters that you write about during the course of exploring your heroine's life. Who are the ones you found most fascinating or memorable? Writing this book made me a big fan of architect Julia Morgan, the woman who Milicent’s father, Camille Rossi, worked under at Hearst Castle. She was a magnificently talented badass. Luckily, Julia Morgan’s legacy was not hidden, and information about her is readily available. Did you know about The Shape of Water before you started writing the book? At what point during the research or writing process did you see it, and what was your reaction to it, as a Black Lagoon fan? I started working on the book in December, 2015, which was a long time before any news about The Shape of Water was announced. I saw the film on its opening night in New York City while I was still writing the book. Sitting in that theater, I started crying with joy during the opening credits. That film is a jewel. Seeing a reimagining of the Creature story with a strong, female main character made my heart explode. What advice would you give to anyone embarking on a nonfiction book about a person whose life is not well-known? Get a library card! There were several pieces of information that I was shocked to get, and I found them all thanks to archivists and librarians. I won’t spoil them for readers of this interview, but what I found was simply fantastic.